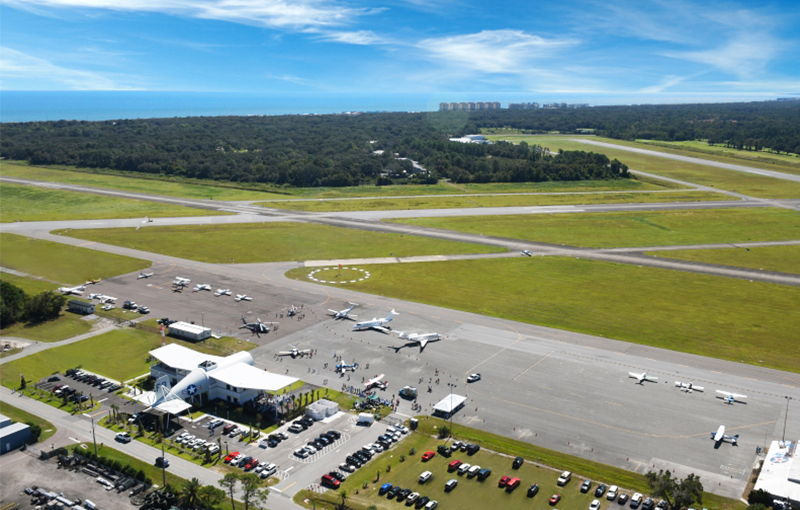 AMELIA Island, Fla. / October 11, 2018 / GENERAL AVIATION NEWS – Bent Wing Flight Services is now operating out of its permanent home at the Fernandina Beach Municipal Airport—the airport’s brand-new $4.5 million general aviation terminal building. The new terminal was designed to represent the F4U Corsair aircraft in honor of the WWII pilots who flew the “Bent Wing Bird” from the U.S. Navy’s Outlying Forward Field—built in 1943—which became Fernandina Beach Municipal Airport. The building features a nose section, skylight cockpit and tail, as well as the distinctive inverted gull wings for which the “Bent Wing Bird” earned its nickname. The interior continues the iconic theme with a two-story glass lobby and a museum-quality replica of the F4U Corsair suspended from the ceiling. Another distinctive feature in the lobby is the custom-made reception desk, crafted from the fuselage and wing flap of a WWII T-6 aircraft. The desk features color-changing LED lights behind strips of Marston Mat, the innovative portable runway developed during WWII. Though the design is historic, its amenities are anything but. The new terminal building meets modern-day function with features designed to meet pilots’ needs with a designated flight planning room, comfortable pilot lounge and shower facilities. In addition, customers will appreciate the large and airy lobby with aviation-themed leather seating, two conference rooms, the “canteen” coffee bistro and a “shopette” store featuring pilot supplies and local gifts. Bent Wing Flight Services offers its customers full-service and self-serve fuel options, concierge services, courtesy and rental cars, catering services, hangar space and after-hours services. Bent Wing Flight Services is Fernandina Beach Municipal Airport’s sole FBO, offering the aviation community full, professional services for a first-class travel experience at KFHB. Honoring the airport’s military roots, the FBO operates out of a brand-new, F4U Corsair-inspired terminal as a beacon of the spirit of aviation and its contributions to our country.